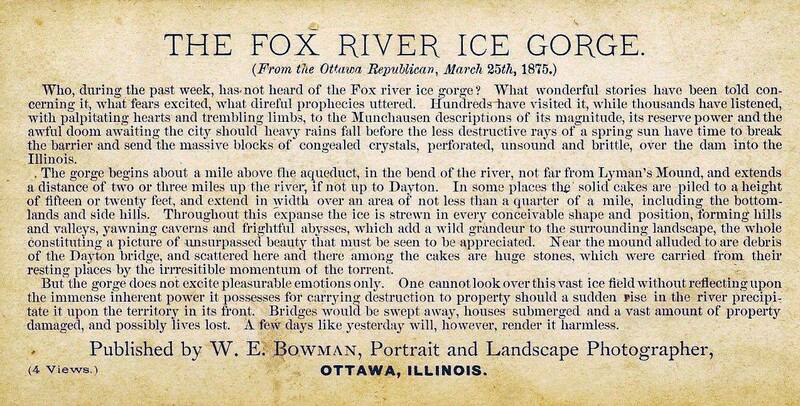 Who, during the past week, has not heard of the Fox river ice gorge? What wonderful stories have been told concerning it, what fears excited, what direful properties uttered. Hundreds have visited it, while thousands have listened, with palpitating hearts and trembling limbs, to the Munchausen descriptions of its magnitude, its reserve power and the awful doom awaiting the city should heavy rains fall before the less destructive rays of a spring sun have time to break the barrier and send the massive blocks of congealed crystals, perforated, unsound and brittle over the dam into the Illinois. The gorge begins about a mile above the aqueduct, in the bend of the river, not far from Lyman’s Mound, and extends a distance of two or three miles up the river, if not up to Dayton. In some places the solid cakes are piled to a height of fifteen or twenty feet, and extend in width over an area of not less than a quarter of a mile, including the bottom lands and side hills. Throughout this expanse the ice is strewn in every conceivable shape and position, forming hills and valleys, yawning caverns and frightful abysses, which add a wild grandeur to the surrounding landscape, the whole constituting a picture of unsurpassed beauty that must be seen to be appreciated. Near the mound alluded to are debris of the Dayton bridge, and scattered here and there among the cakes are huge stones which were carried from their resting places by the irresistible momentum of the torrent. But the gorge does not excite pleasurable emotions only. 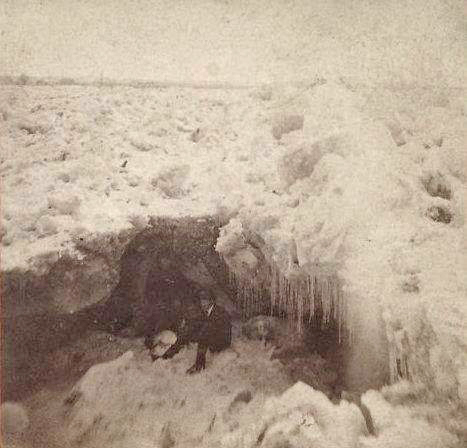 One cannot look over this vast ice field without reflecting upon the immense inherent power it possesses for carrying destruction to property should a sudden rise in the river precipitate it upon the territory in its front. Bridges would be swept away, houses submerged and a vast amount of property damaged and possibly lives lost. A few days like yesterday will, however, render it harmless.